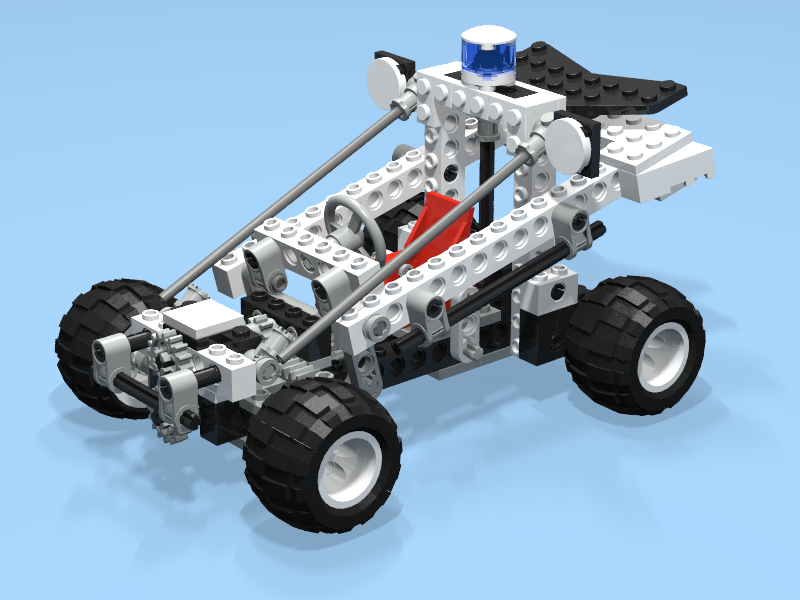 Revisiting 8230 Coastal Police Buggy – Stud.io Review | Christoph Bartneck, Ph.D.
Back in 1996 I created 3D animated building instructions for the set 8230 Coasatal Policy Buggy. It was part of an internship at a 3D Company and it took me months to model every brick and to animate the whole model. Below is a rendering that took half a day to render. Twenty years later it is time to build this model again. 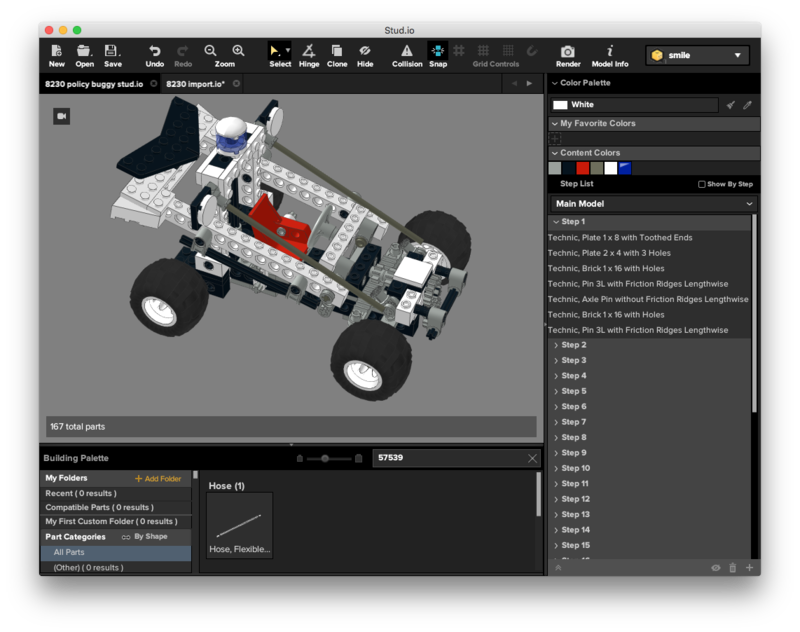 Not with LEGO Digital Designer (LDD), but with Stud.io, the latest addition to virtual LEGO editors. 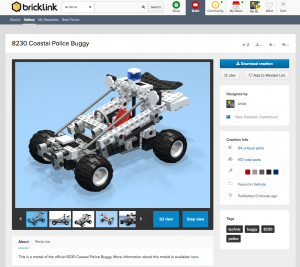 Stud.io is currently a closed beta and the makers of Bricklink sign responsible for its development. The user interface is clearly structured but I am missing keyboard shortcuts for selecting the various tools. Some shortcuts for moving and rotating parts/views are already available and I hope that Bricklink will add more short cuts soon. 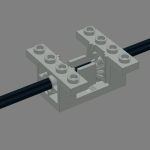 Stud.io can import (but not export) .lxf files from LDD but, even better, it can import all the parts of an official LEGO model. 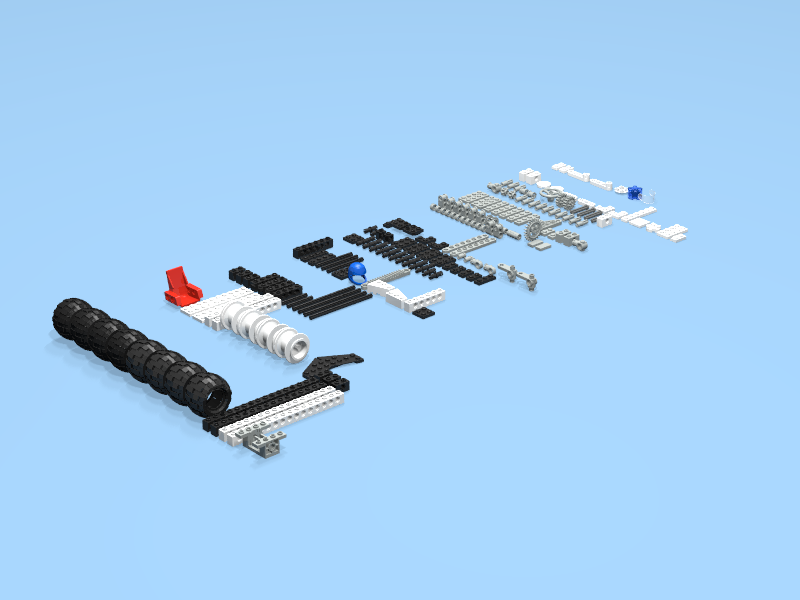 It nicely arranges all the parts according to the inventory at Bricklink. Unfortunately, this import is not perfect, since it some parts are imported twice (e.g. the wheels) since they are listed as counter parts in the Bricklink inventory. But these extra parts can be easily deleted. More seriously, not all the parts in the model are available as parts. The Technic Minifigure and the hose are not available. Neither are they in LDD. 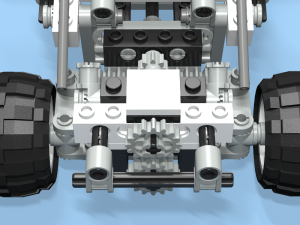 As a matter of fact, Stud.io seems to know a lot more old parts than LDD. The same holds true for colors. 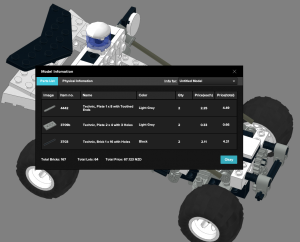 But Stud.io still lacks a couple of important functions that are present in LDD. The Hing Align and Flex Tool are not yet available. This made it impossible to position the hose correctly. 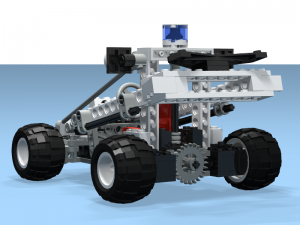 On the plus side, Stud.io allows you to switch Collision Control and Snapping on and off. This is very convenient when you know that the parts are supposed to fit. Sometimes the geometry of the parts do not seem to be incorrect. 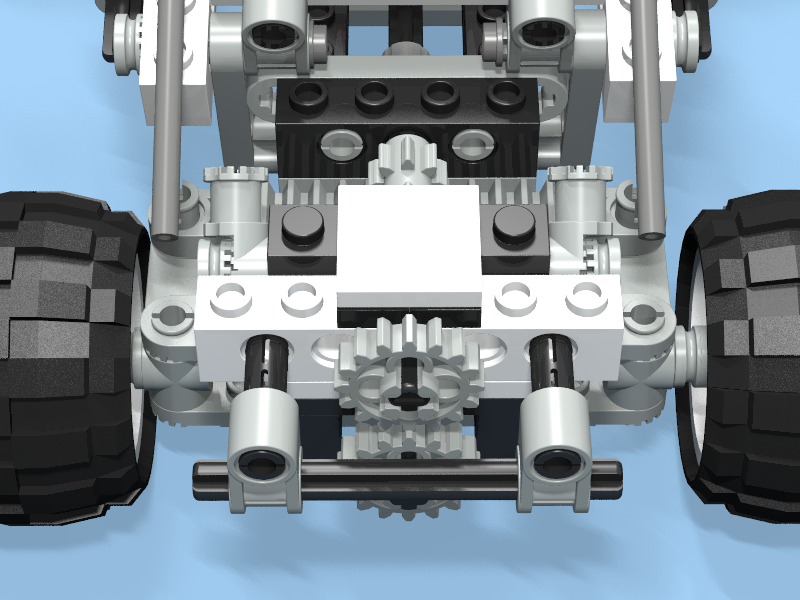 Positioning an 18 tooth wheel in a Technic gear box proved to be impossible while collision control was switched on. 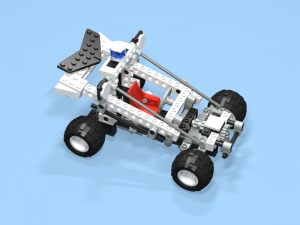 Once I switched it off I could position it as desired and Stud.io indicates the collision by outlining the bricks involved. 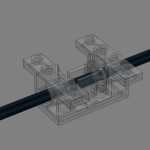 LDD does not have this problem for the combination of these parts. For tooth wheels Stud.io seems to be much more forgiving than LDD. You do not have to make sure that the teeth of two wheels are properly aligned. It does not even trigger a collision alarm. During the building of the model it is important to group the parts into logical steps. This will become the steps of the building instructions. Well, once this function is implemented. There is currently no way to export any instructions. 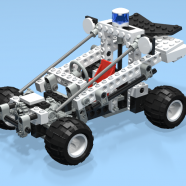 You can, however, upload the model to Bricklink and make it available to others. You can even build a model together with others, but this is a function that I still need to test. The rendering is done using POV Ray and on my Mac a Terminal window pops up to inform me about the rendering process. LDD never had a good render engine and only Bluerender was an good workaround. The quality of the rendering is great, but you cannot yet force the render engine to highlight the edges of the bricks. There is also no option to setup the environment other than the color of the ground. You cannot yet position lights or have detailed control of the rendering. 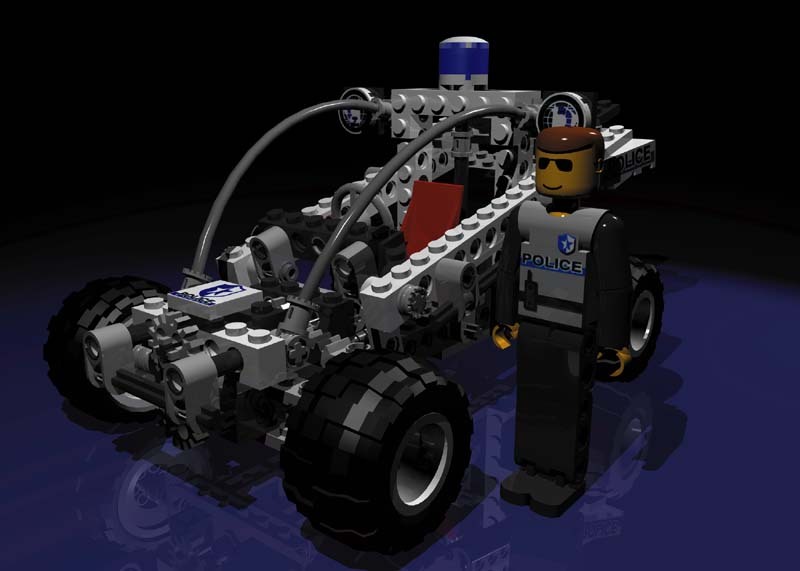 Bluerender can spin the model for you can create a little movie of the model and I hope that Stud.io will give us better control of animations, lights and camera soon. One of the the unique features of Stud.io is that it estimates the costs of the model based on the pricing information in Bricklink. This is an excellent reality check, but this does not take into consideration shipping costs and from how many sellers you need to purchase your bricks. Still, an interesting feature. 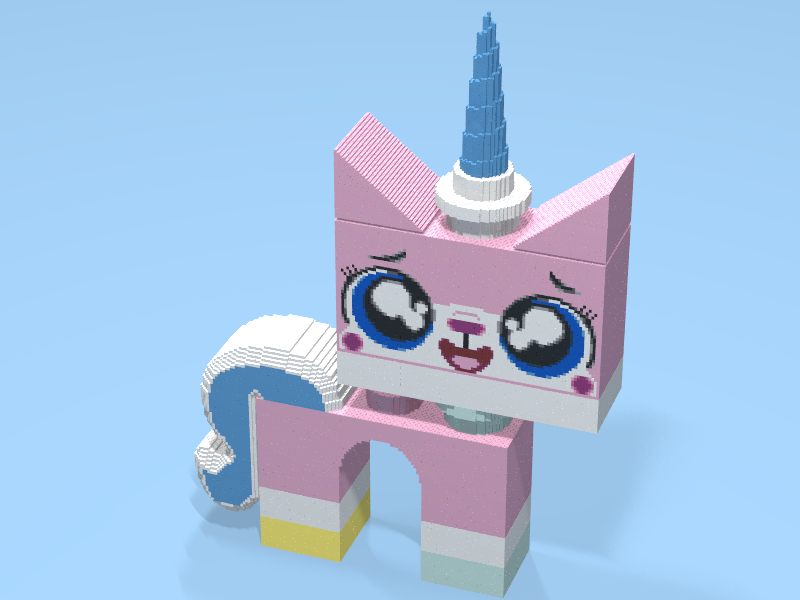 I then took Stud.io for a real challenge and imported my 21k brick Unikitty MOC. The model imported without any problems but the display of the model became sluggish. Moving the camera and zooming in and out was by far not as smooth as with LDD. Still, it gave me an actual estimation of the building costs for the model (around 4500 NZD) and the rendering worked out just fine. Overall I am very happy with this beta. The software did not crash and only the render engine needed a second click every once in a while. 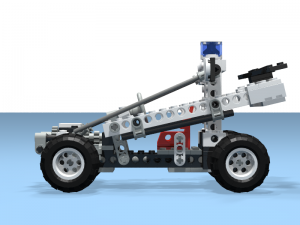 This is an excellent start and I see so much potential for Stud.io. 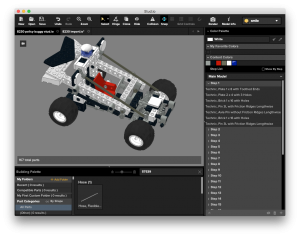 The software is much better than current LDraw editors and has the potential to become even better than LDD. This might be a problem for many LEGO builders and LDD does not have such a claim in their license. Something to think about. “Thank you for forwarding a user’s meessage to me. I fully understand your (or one of your user’s) concern and the issue definitely needs clarification. We DO NOT intend to use uploaders’ content without their consent unless they intended to SHARE their creations to the public. That being said, the ToS will not be applied to their creations uploaded to their private space including Wanted List or baseplate simply to manage or purchase parts. The terms should be applied to the cases only when creators agree to share their creations with other BrickLink users. So there is still hope, but the fact remains that as soon as you make your MOC model public it will become property of Bricklink. That is a very advanced form of sharing. 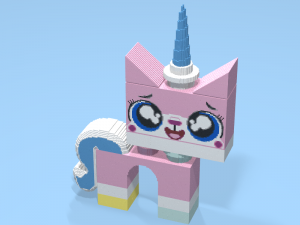 Thanks for the read, the quality of the brick meshes in Stud.io is far superior for the most part than LDD so its no surprise the amount of polys caused your Graphics card to chug a little with kitty. Recently started using the software myself and even though I’m a die hard LDD fan I cant see myself going back to it.